READ BELOW ABOUT THE ESSENTIAL OIL INFUSED PRODUCTS PERFECT FOR INFANTs! While babies are known for their cuddly softness, dry skin affects infants just like adults. Hot baths, dry air, irritants, and other factors can all leave your baby uncomfortable and fussy. This non-greasy lotion supports moisture barrier function and smoothly absorbs into your baby’s delicate skin, leaving it moisturized, soft, and smooth. Made without alcohol, parabens, synthetic fragrances, artificial dyes, or other unwanted ingredients, Seedlings Baby Lotion is formulated with 100 percent plant-based ingredients and pure essential oils to soothe your little one with a light, calming scent. Click here to learn more about this product. 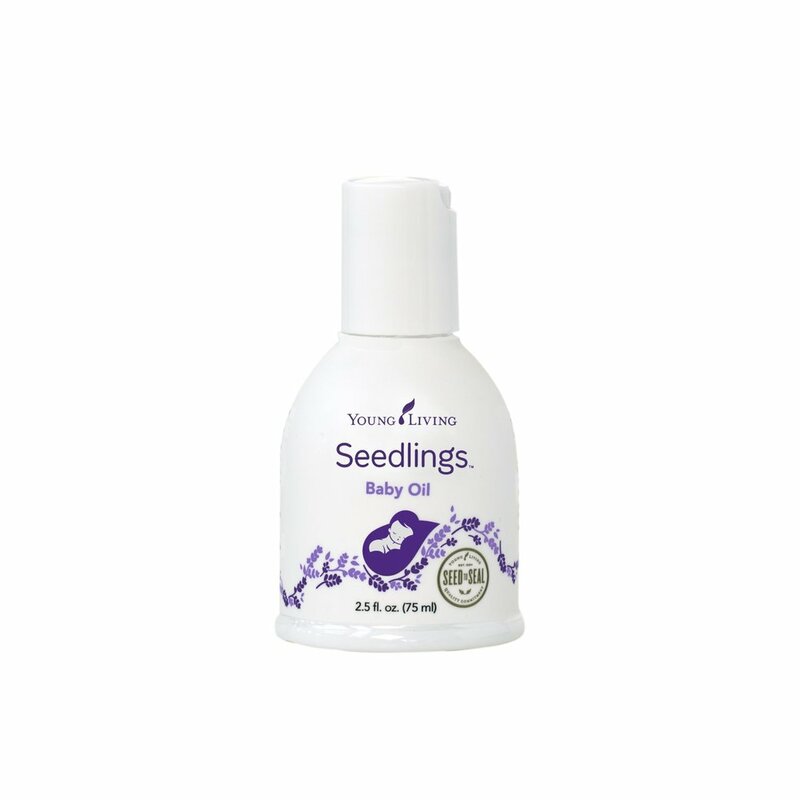 Young Living’s Seedlings Baby Oil is formulated specially for your infant’s delicate skin. This mild, gentle product contains 100 percent pure essential oils diluted to an appropriate strength; and its naturally derived, plant-based formula is lightly scented with our Calm blend of Lavender, Coriander, Bergamot, Ylang Ylang, and Geranium. This non-greasy formula moisturizes, soothes, and nourishes baby’s skin. It absorbs smoothly; provides a light, calm aroma; and promotes a relaxing environment. Formulated without mineral oil, it is vegan friendly and suitable for everyday use. Click here to learn more about this product. Seedlings Baby Wash & Shampoo is specially formulated for your infant’s delicate skin and hair. This mild, gentle, tear-free formula is 100 percent plant-based. Its naturally derived formula is lightly scented with our Calm blend of Lavender, Coriander, Bergamot, Ylang Ylang, and Geranium. It leaves skin and hair clean and soft and makes tangles easy to comb out. Perfect for infants, toddlers, and kids alike. This product is sulfate-free, vegan friendly, and perfect for everyday use. Click here to learn more about this product. Seedlings Baby Wipes are ultra-soft and comfortable. The soothing formula leaves skin moisturized, soft, and smooth, while providing gentle and thorough cleansing without drying your infant’s delicate skin. Seedlings Baby Wipes can be used on any part of your infant’s skin. Soft, thick, and versatile, these wipes can handle a diaper change or a lunchtime cleanup. Vegan friendly, this mild and gentle formula contains cleansing botanicals and 100 percent pure essential oils and is specially formulated to minimize the risk of common allergic reactions. Click hereto learn more about this product. Keep little bottoms comfortable without using harsh chemicals that could irritate sensitive skin. Seedlings Diaper Rash Cream is made with 100 percent naturally derived ingredients, including 100 percent pure essential oils. This thick, Lavender-scented cream reduces the duration and severity of diaper rash when applied at the first sign of redness. It soothes on contact, protects your baby’s delicate skin, and acts as a physical barrier to wetness. It can be used as a preventive measure before bed, or anytime when exposure to wet diapers may be prolonged. Click here to learn more about this product. Wrap your baby up in a soothing, relaxing atmosphere with Seedlings Linen Spray. This gentle, alcohol-free spray adds a calming aroma to linens with a formula specially created for infants. Use it to refresh crib sheets, blankets, car seats, clothing, and other fabrics with the calming aroma of Lavender, Bergamot, Ylang Ylang, and other pure essential oils. With a naturally derived, vegan formula, this calming spray is gentle enough for babies and parents alike. Click here to learn more about this product. Soothe delicate skin with Young Living’s mild and gentle baby balm. Tender Tush baby ointment, part of Young Living’s KidScents line, is an essential oil balm formulated with natural vegetable oils and pure essential oils—including Frankincense, Lavender, and Ylang Ylang—to moisturize and nourish dry or occasionally irritated skin. Made without synthetic perfumes, mineral oils, artificial colorings, or harsh chemicals, this mild essential oil moisturizer promotes healthy skin while soothing sensitive skin. Many have used this ointment during diaper changes. Click here to learn more about this product. Channel your baby’s inner genius with GeneYus! This is an excellent blend to support the mental growth and brain health of babies and children. It’s pre-diluted, so it’s a great one to apply on young and delicate skin. Designed for young minds that are working on growth and development, it’s a great essential oil to be diffusing in the nursery in the mornings or in the playroom during tummy time. Click here to learn more about this product. The baby and toddler stage can be an explorative one! That’s why it’s important to have Owie essential oil in your arsenal to apply when your child experiences any minor or occasional skin irritations. Apply directly on the desired location to improve the appearance of your child’s skin. Since it’s pre-diluted, it’s great even for the most sensitive of skin! Click here to learn more about this product. The first few months of a baby’s life can be quite an adjustment when it comes to sleeping throughout the night, and resting well during nap time. That’s why SleepyIze is a perfect blend to help your baby’s sleeping patterns! Diffuse this oil in their nursery or apply topically on the feet and spine. Since it’s pre-diluted, it’s great for sensitive skin. Click here to learn more about this product. SniffleEase is a rejuvenating and refreshing blend formulated just for your little ones. It’s a popular one to diffuse and apply during winter months, or during seasonal changes. Since it is pre-diluted, it’s great for sensitive skin. When applying, many moms like to apply on the bottoms of the feet, chest, spine, and under the nose. Click here to learn more about this product. TummyGize is a relaxing, quieting blend that can be applied to little tummies. This is a great one to have on hand as new babies are learning to breast feed or adjust to baby formula and other diet changes. Since it’s pre-diluted, it’s great for even the most sensitive skin. Apply on the tummy, feet, and lower back. Click here to learn more about this product.